The Past Masters of Lodge Zetland No 391 performed the Third Degree ceremonial at the Lodges Regular Meeting held on Tuesday 16th April 2013. 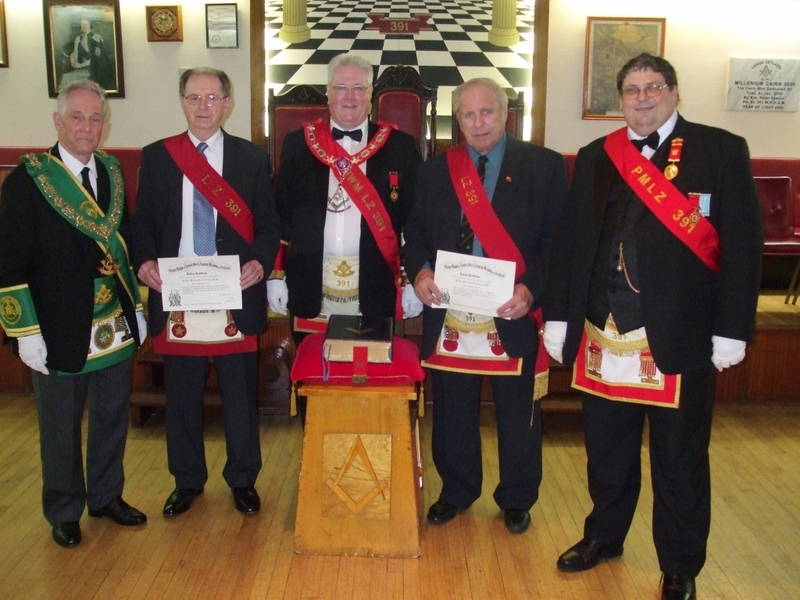 On that evening Bro William Dawson and Bro John Thompson were presented with 50 years Jubilee Certificates prior to the ceremonial being carried out. Between the two brethren they had amassed some 108 years service to their Lodge. A small deputation of members of Provincial Grand Lodge were in attendance. The picture below shows (from left to right) Brother Andrew A McKinnon RWPGM, Brother William Dawson, Brother Peter Dawson RWM of Lodge Zetland, Brother John Thompson and Brother David Thompson PM, son of Brother John Thompson who made the presentation to both brethren. Congratulations to both Brethren in reaching this milestone.